Many people believe that insulin resistance causes obesity. But as you’ll see in this article, it may very well be the other way around. Excess body fat appears to drive insulin resistance. But first, your fat cells need to be insulin sensitive to fill and expand beyond your Personal Fat Threshold. Once your adipose tissue becomes resistant any excess energy is then shunted into your bloodstream and vital organs, leading to the most prevalent modern diseases such as diabetes, heart disease, Alzheimer’s and Parkinson’s. Suppressing the use of our body fat (lipolysis) while the energy from your food is used up. What happens if we have no insulin? You may not always like the fat storing function of insulin, but we have to take the good with the bad. We simply cannot live without it. Experience elevated blood glucose and BHB ketones (a.k.a. diabetic ketoacidosis). You may be a little bit jealous of people with type 1 diabetes, thinking that if you could only decrease your insulin a little bit, you’d lose weight. But having zero insulin is a life-threatening situation. It’s been less than a century since we’ve been able to treat people with type 1 diabetes (like my wife Monica) with exogenous insulin to keep them alive. As shown in the photos below, people with uncontrolled type 1 are essentially falling apart. They are quickly leaching their stored energy into their bloodstream via uncontrolled gluconeogenesis and lipolysis. However, as demonstrated in the ‘after’ photos on the right-hand side, once they receive insulin treatment, people with type 1 are able to use the energy from the food they eat, and no longer consume their muscles for fuel. The most successful approach for people with type 1 diabetes tends to involve fewer carbohydrates without limitations on protein, particularly for growing children. Adequate insulin dosing is critical to maintaining healthy blood sugar levels as well as enabling the use of protein for growth, repair and maintenance of muscle. A more modern example is Dave Dikeman, son of RD Dikeman who is one of the admins of Type 1 Grit who follow Dr Bernstein’s recommendations for the treatment of diabetes. Dave is shown here in hospital after diagnosis and below recently with his dad. While some people warn nitrogen poisoning, Dave seems to be thriving on about 250g of protein per day (i.e. about 4.7 g/kg LBM). Getting adequate insulin to metabolise the protein required for growth and repair while limiting carbohydrates to maintain normal blood sugar levels appears to be crucial to success for people with diabetes. What happens if I am insulin sensitive? Being “insulin sensitive” means that don’t need much insulin to get the job done. Glucose can enter your cells to be used for energy. Your liver responds to insulin and controls the release of glucose and ketones into the bloodstream. You will build muscle relatively easily. Your body can efficiently store excess energy as fat, and your adipose tissue can grow quickly. Having great insulin sensitivity is a double-edged sword. While you can control the release of glucose and ketones from your liver into your bloodstream and build muscle, you can also build fat stores quickly. You need to be insulin sensitive to become morbidly obese. I used to believe that if I could become insulin sensitive by reducing carbohydrates and protein. I thought the key to success was to increase my ketones by eating more fat so I could melt away my body fat, a bit like someone with untreated type 1 diabetes. (There is a practice called diabulimia where some type 1s intentionally restrict their insulin dosing to lose weight, however, this is a very dangerous practice which drives ketoacidosis, fatigue, muscle wasting, high cholesterol and death). But ironically it turns out that having insulin-sensitive adipose tissue actually enables your body fat stores to expand to accept more and more energy from the food you eat before they start being channelled into other areas of your body. People who are obese are often insulin resistant. However, this is not always the case. You can be insulin resistant and still be lean. You can be obese and still be relatively insulin sensitive. If you are both insulin resistant and obese, the obesity probably came first. How do I become insulin resistant? Professor Roy Taylor has done some fascinating work showing that different people develop diabetes at different body fat levels. He coined the term ‘Personal Fat Threshold’ to describe this observation. For whatever reason, some people develop diabetes at a low level of body fat while other people need to become obese before they experience elevated blood sugars. Some people are ‘blessed’ with the ability to expand their fat stores a lot more than others before their fat stores become full. While most people want to be lean with low levels of body fat, the ability to continue to expand your fat stores can be an advantage. People who could successfully store lots of energy in their adipose tissue were more likely to survive a famine or a long journey in a canoe to settle a new island or continent. This phenotype is sometimes called metabolically healthy obese. Unfortunately, these populations appear to suffer the most when exposed to hyper-palatable nutrient poor insulinogenic western food. Highly insulin sensitive and primed for storage of available foods, they very quickly become obese and eventually, after gaining a lot of body fat, diabetic. They also seem to be genetically programmed to ensure that they survive the next famine more than others, so when given the opportunity they become more ‘addicted’ to these energy-dense obesogenic foods. For example, sales of Coca-Cola are the highest on a per person basis in Australia’s Northern Territory in where there is a high proportion of indigenous Aborigines. Even today, when famines are less common, being able to build large energy stores in your adipose tissue is still an advantage. These people can store more energy on their body before it gets funnelled into places that fat does not belong (e.g. your liver, pancreas, heart, eyes and brain). It’s when your fat stores become insulin resistant and cannot store any more energy things get ugly. When your fat stores get full and can not accept any more energy we say they become resistant to the effects of insulin. Your pancreas ramps up its efforts to store energy. But in spite of the increasing levels of insulin, less and less energy can be forced into fat stores. It’s at this point that the excess energy starts to get funnelled into areas of your body that are now more insulin sensitive than your body fat like your liver, pancreas, heart, eyes and brain. In this video, Ivor Cummins discusses the concept of adipose tissue hypertrophy and how diabetes begins in the fat cells. I also highly recommend this widely shared podcast with Mike Julian and Alex Leaf, where they share their insights. Like many of my posts, most of the insights in this article are gleaned from them based on the latest research that they share in the Optimising Nutrition Facebook Group. If you haven’t seen it yet, this video from Ted Naimin is a must watch on the topic of insulin resistance. People who have lower personal fat threshold are sometimes called TOFI (i.e. thin on the outside, fat on the inside). These people may look skinny because they have less body fat stored underneath the skin (subcutaneous fat) but they often have lower levels of muscle and much higher amounts of fat stored around their vital organs (visceral fat) and will see elevated blood sugars much earlier. Being TOFI is arguably more dangerous than to be metabolically healthy obese. An extreme example of TOFI is lipodystrophy were people cannot gain body fat and quickly develop diabetes, hyperinsulinemia, fatty liver, hypertriglyceridemia and heart disease because they aren’t able to buffer their energy in their fat stores before it goes to their vital organs. So as you can see, if we want to be accurate, it’s not obesity per se that is causing metabolic dysfunction, it is being overfat relative to your Personal Fat Threshold. As your body fat stores start to fill, you will also see elevated levels of energy in your bloodstream in the form of elevated glucose, ketones and free fatty acids. The table below shows the official diagnosis criteria for Type 2 diabetes in terms of fasting glucose, blood glucose after eating and HbA1c. However, while the diagnostic criteria define half the population currently as ‘normal’, normal is far from optimal. If you’re chasing optimal health, the table below shows target blood sugar and HbA1c values that correspond to optimal blood sugar control. The body tends to find a balance between glucose and ketones depending on available fuel sources. However, the presence of higher BHB ketones is not necessarily a sign of optimal health. Higher BHB ketone levels can be a bad sign, especially when they are accompanied by higher blood glucose and free fatty acids. 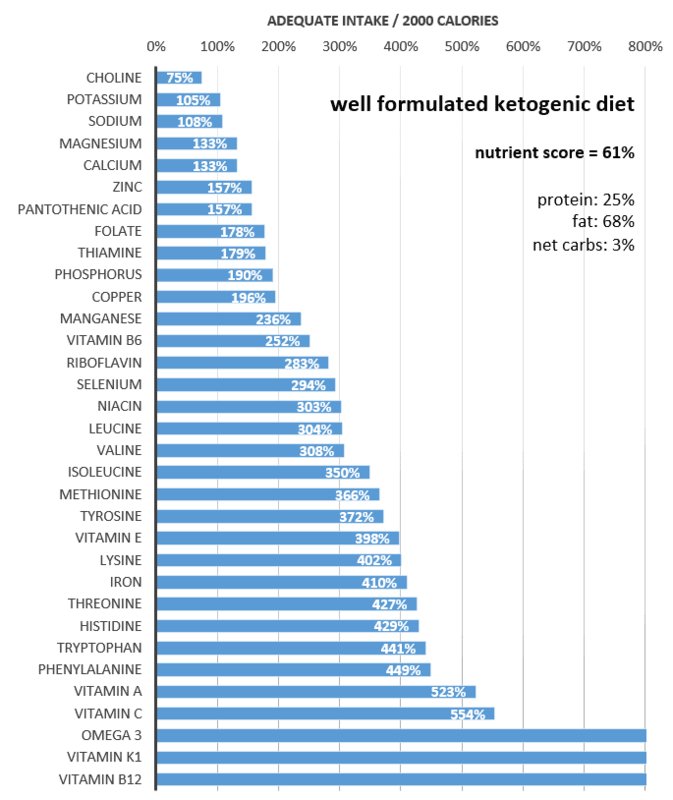 The chart below shows the sum of about three thousand data points from glucose and BHB ketones measurements for people following a low carbohydrate or ketogenic diet. It appears from this data that people who are metabolically healthy tend to have lower blood glucose and lower ketone values, even if they are following a ketogenic diet. If your goal is to use body fat for fuel, then you will want to be further to the left of this chart with a lower total energy in your bloodstream from glucose and ketones. Initially, in an energy deficit, you will lose water weight quickly as you empty your glycogen stores, then your blood sugars will reduce. Then eventually once the faster burning fuel sources are consumed your body will turn to stored body fat. The table below shows the blood glucose and ketone values if we divide the three thousand data points in the chart above into five quintiles. It appears that lower blood glucose levels are typically associated with lower ketone levels even on a ketogenic diet. You may see higher ketone values during a long-term fast or calorie restriction, but generally, ketone levels in the fed state in healthy person on a low carb or ketogenic diet might range between 0.3 and say 1.1 mmol/L with blood glucose less than 5.0mmol/L or 90 mg/dL. To use an engineering analogy, you can think of your liver as dam wall holding back the floodgates of energy in your body while insulin is the signal to raise the floodgates. If you have a flood of energy coming in your liver will have to release some of the excess energy into the bloodstream. If you have lower levels of energy coming in from your diet you will need less insulin to force the liver to hold back the flood of energy stored in your body. Once you decrease the energy coming in from your diet, your pancreas will be able to slow the production of insulin, which will allow your body fat stores to fill the energy gap. The ketone data from the recent Virta study below also supports the case for ketones being correlated with body fat levels for people on a ketogenic diet. Their overall metabolic health improved. The chart below shows the weight loss over the same period of decreasing ketone values. As detailed in this article, BHB ketones can be seen as a storage or transport form of ketones that can be used by the brain and heart but need to be converted back to Acetoacetate to be used by the rest of the body. While they appear to be useful in some therapeutic situations, higher BHB, for the most part, should be seen as an indication of excess energy status rather than excellent metabolic health. How do I become insulin sensitive? Professor Taylor’s research also demonstrated that people become insulin sensitive again once they come back under their own ‘Personal Fat Threshold’ by reducing the pressure in their adipose tissue cells (i.e. lose weight). With only a small amount of weight loss, their blood sugars come back into line and they start to lose fat from in and around their vital organs. Or to think of it another way, once you use up the surplus energy in your bloodstream, your body will start feeding on the fat stored in your vital organs as the first priority. Once our body fat levels decrease to below our Personal Fat Threshold, it seems that they quickly become insulin sensitive and can take in any excess energy. There is less overflow of energy from the fat cells to spill out into the bloodstream. The bad news here is that once your adipose tissue becomes insulin sensitive again it can grow quite easily given an environment with surplus energy. Being more insulin sensitive is part of the reason why it’s so easy to regain weight. While a low carb diet masks the symptoms of diabetes by stabilising blood glucose levels without a significant reduction in body fat levels, people who lose a significant amount of body fat below their Personal Fat Threshold are no longer diabetic and can pass an oral glucose tolerance test. Their fat stores can quickly expand to absorb the incoming energy. Unfortunately, as soon as they put the weight back on (i.e. refill their fat stores), they become diabetic again. One criticism of Professor Taylor’s work is that it was done with Optifast shakes to ensure rapid weight loss while still getting adequate nutrition (even though it was from meal replacement shakes full of supplements). The ideal would be that people could learn to create nutrient-dense whole food meals. Many people find this hard to do in real life, hence the use of meal replacement shakes in order to remove this variable. The Nutrient Optimiser has been designed to help people form new habits of eating nutrient dense meals that are aligned with their goals. How do I know if I’m insulin resistant or insulin sensitive? There are a range of ways to test to if you are insulin resistant. The simplest way is just to test your blood sugar fasting and before a meal. The tables above show some suggested levels at which you should start to be concerned. If your blood sugars are elevated then it’s an indication that you are exceeding your Personal Fat Threshold. Fasting insulin levels are also a good guide to determine if you are starting to develop insulin resistance. Healthy hunter-gatherer populations have a fasting insulin of 3 – 6 mIU/mL.The average insulin levels in western populations are 8.6 mIU/L. One of the most common tests used in diabetes is the OGTT which is where you drink a sugary drink and see how much your glucose rises over time. A more accurate way to understand you are insulin resistant is to test your insulin response to food. In the chart below the negligible insulin response (blue) is Type 1 diabetes (i.e. insufficient insulin), the green is a healthy insulin response, while the yellow (pattern II), orange (pattern III) and red (pattern IV) are indicative of diabetes and insulin resistance. While you may have great blood sugar levels, your pancreas may still be working overtime to store the energy from your food in your fat stores, so it doesn’t spill over into your bloodstream. A Kraft insulin dynamics test, while expensive, is the gold standard in insulin testing. Dr Kraft’s analysis suggested that 80% of people are using excess insulin to suppress glucose, while a normal glucose screen would suggest that only two-thirds of people are fine. If you have your fasting insulin and glucose data, you can calculate your HOMA-IR which is a measure of the amount of insulin that you need to maintain your blood sugars. This can be useful for low carbers who sometimes have higher fasting glucose but lower insulin. The formula is shown below or you can use an online calculator like this one. You can also use your blood cholesterol test data to understand if you are really insulin resistant. A triglyceride:HDL ratio greater than 3 (in US units) suggests that you may be insulin resistant. A trig:HDL ratio less than 1.1 is optimal. You can use a calculator like this one to make sure you get the units right. Waist to height ratio is a simple and effective way to understand if you need to take evasive action to lose weight. A waist to height ratio of greater than 0.5 for men and 0.46 for women is associated with increased risk mortality. Regardless of whether you are insulin sensitive or insulin resistant, it is highly advisable to do what it takes to reduce your body fat to get your waist to height ratio in check. Some people will find that they still need to lose further weight to get within their personal fat threshold to get optimal blood glucose and insulin levels. 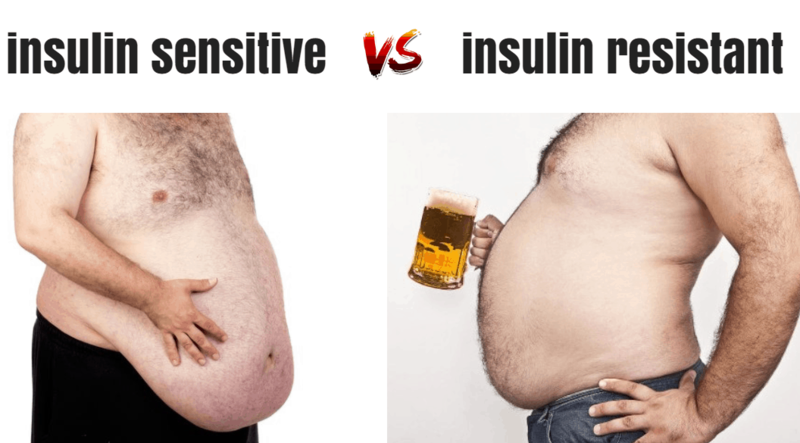 If you are insulin resistant, your fat tends to get stored in your organs so you may have a big hard ‘beer’ belly. Someone with abdominal obesity may find their belly is hard because more fat is stored inside around their organs. If you are insulin sensitive, you may have a big belly but it might hang down more like a floppy garbage bag. Someone like this is ‘blessed’ to have insulin sensitive adipose tissue that continues to expand more before they develop diabetes and the complications of metabolic syndrome. The table below shows values for various parameters that are indicative of insulin resistance. If you are looking for optimal health, you should target values similar to those in the Quartile 1 column. While replacement of normal healthy levels of insulin is critical for people with type 1 diabetes, supraphysiological doses of insulin only mask symptoms of a poor diet for people whose pancreas is still functioning well. The chart below shows that complications of diabetes (i.e. cardiovascular disease, stroke, coronary heart disease) increase with higher HbA1c. Lowering HbA1c however by just using anti-diabetic medications to suppress blood sugar does not help the outcome. Excess exogenous insulin forces the excess energy into our fat stores, and then subsequently into other more sensitive areas of the body such as our vital organs, brain and eyes. You can’t just keep eating loads of processed insulinogenic crap and trust that all will be well because your blood sugars are lower. Exogenous insulin combined with a poor diet actually exacerbates the complications of diabetes. You need to fix your diet and then add enough insulin to maintain healthy blood glucose levels and effectively use the protein in your diet to build and repair your muscles. Insulin-dependent diabetics dose with both bolus (or burst) insulin and basal (or background) insulin. Bolus insulin is mealtime insulin and basal is needed whether you eat or not to enable you to keep your stored energy behind the floodgates of your liver. You can reduce the amount of bolus insulin required for food in the short term by reducing the insulin load of your diet. For someone on a standard mixed diet, about half of their insulin dosing will be bolus with half as basal. For someone on a low carb diet with a lower insulin load, the majority of their insulin demand will be for basal insulin, with only a small amount required to cover food. Most low carbers or ketogenic dieters focus on reducing the insulin load of their diet by removing carbohydrates, and sometimes protein, without paying much attention to incoming energy from fat. This is fine on a whole food Atkins type diet because reducing carbs will typically force a reduction in overall energy intake. Ignoring energy balance becomes a problem though when you start to ‘hack’ your low carb/keto diet with refined fats, fat bombs and fatty coffee that enable you to get heaps of energy with few carbs and negligible micronutrients. The irony here is that, in the bigger picture, insulin demand is actually related to your overall stored energy status, as described in this video from Chris Masterjohn. As shown in the chart below, people with a larger BMI typically have higher levels of insulin because, as the stored energy in your system continues to increase (regardless of the macronutrient source), our insulin levels have to increase to hold back the flood of stored energy while the excess energy in our system is used up. The chart below shows that someone who is obese and insulin resistant will have higher insulin levels when they are fasting. They will also have much higher excursions of insulin after eating due to their insulin resistant adipose tissue not accepting the excess energy. As our body fat stores continue to build and we keep on taking in energy, our pancreas continues to ramp up insulin production to keep energy in storage until you need it. In the “good old days” this wasn’t a problem because there were always times when we didn’t have food available. These days food is relatively cheap, easy to obtain and always associated with celebrations, family, social occasions and self-soothing. So you are always in storage mode. As you remain obese, you become resistant to your own insulin and need more and more insulin to do the job. Eventually, your pancreas can burn out through overuse, and you become an insulin-dependent Type 2 diabetic. Overall, the macro-nutrient composition of our diet only has a relatively small influence on our insulin levels. Our basal insulin has a much more significant effect on our fasting insulin levels. We can manipulate our diet by reducing carbohydrates to reduce the bolus insulin demand of our food. However, we can have a much more dramatic impact on our insulin levels by reducing the total energy levels in our body by finding a way to maintain a long-term energy deficit. TL;DR… Reduce body fat while preserving lean muscle mass. Lean muscle mass is important because it burns both fat and glucose. Without muscle, you won’t be able to quickly use the energy from fat and carbs that you eat. Lean muscle mass is also critical to insulin sensitivity and longevity. As you get older, it becomes harder to maintain lean muscle mass. You will need more protein as you get older to slow the inevitable loss of muscle mass. Once you become weak and frail, your chances of falling and breaking your hip and never getting up again increase! There is ongoing discussion/argument/controversy about how much protein is ‘too much’. My analysis of nutrient density suggests that getting a minimum of 1.8 g/kg LBM or about 20% of energy is a good starting point. More can be better if you are active, lifting heavy or trying to lose fat. If you focus on getting the nutrients that are harder to find, adequate protein is really a non-issue. 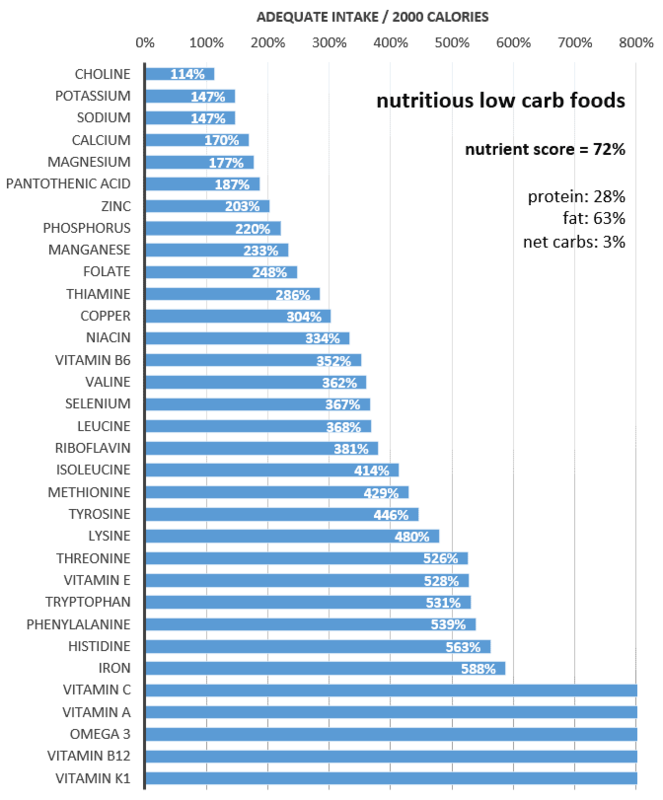 The nutrient profile of the most nutrient-dense foods shown below is generated by prioritising foods that contain the harder to find micro-nutrients (i.e. choline, calcium, magnesium, vitamin E, potassium, pantothenic acid & zinc). By contrast, if we focus on avoiding protein, we get an abysmal nutrient profile as shown below. This is why I get so frustrated when people get worked up about ‘too much protein’ or minimising protein in order to achieve elevated ketones as if that was the ultimate goal of health. 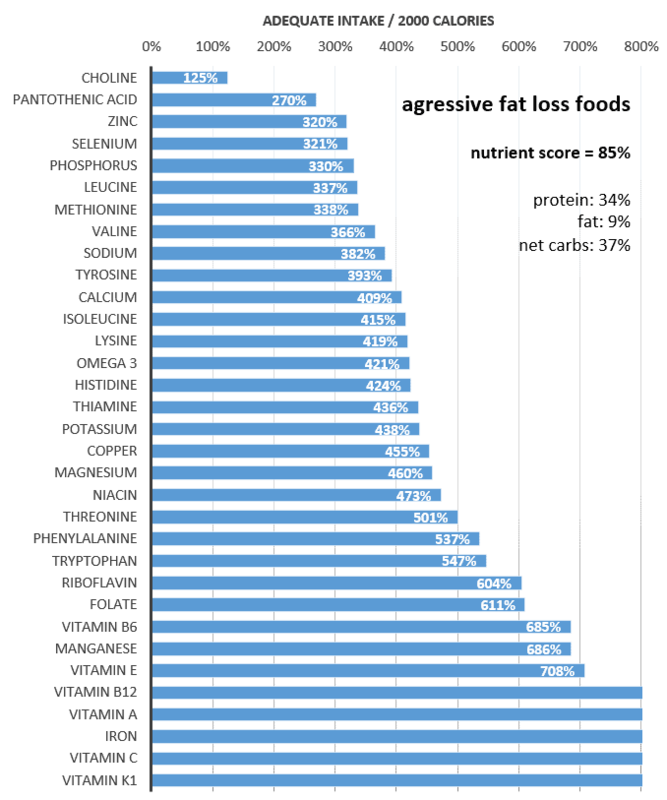 We also risk malnutrition if we focus on the most ketogenic foods (i.e. high fat, low carb, low protein). For most people, their primary goal is health and weight loss and to look great naked, not having high ketones. 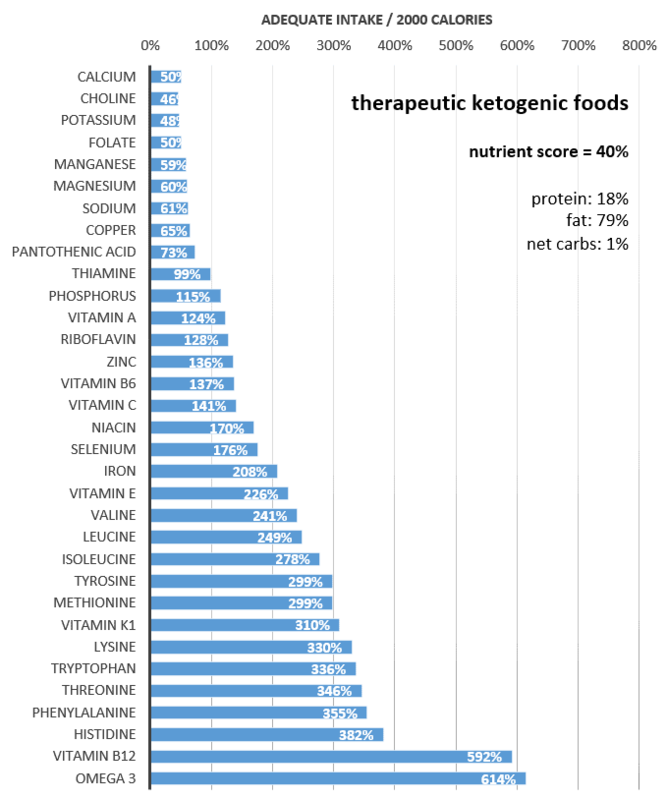 So, unless you need a therapeutic ketogenic diet to manage epilepsy, Parkinson’s, Alzheimer’s, dementia or something similar, then there is no need to compromise your nutrition profile by trying to avoid protein or maximise ketones. Ironically, it’s the people who are insulin resistant that probably needs more protein because they are not able to use the protein available as effectively and they are also losing more amino acids into the blood stream via poorly controlled gluconeogenesis in the liver. For comparison, the three nutrient profiles are shown below (most nutrient dense, low protein and most ketogenic). Incorporating more of these nutrient dense foods is a great ‘hack’ to ensure you are getting enough nutrients without excessive energy intake. Some other approach that works for you that enables you to maintain an energy deficit in the long term. Suggested meals to start you off on your journey into nutritious eating. Some people may find some of the concepts in this post hard complex and difficult to implement. The Nutrient Optimiser which will continue to adapt as you improve your metabolic health. We are also working on a dashboard that will track your the biometric data that you have (e.g. weight, blood sugars, waist:height ratio, food logs, ketones etc.) to guide you on the path to help you reach your goal. Who needs a low carb diet? So, if insulin resistance is primarily about managing our energy levels, does anyone need a low carb diet? Being married to someone with type 1 diabetes and involved in the online diabetes community I have seen firsthand the importance of managing carbohydrate intake. For someone injecting insulin to cover carbohydrates and protein, a low carb diet enables them to match the smaller dietary insulin load with smaller doses of exogenous insulin. There will always be errors in calculations in matching insulin to food, so a smaller insulin load enables you to reduce the errors in insulin dosing. Dr Richard Bernstein calls this The Law of Small Numbers. Similarly, if you have type 2 diabetes and are injecting insulin, reducing the insulin load of your diet can help you reduce the amount of exogenous insulin you require. This can in turn help reduce the swings in blood sugar which can help to stabilise appetite and reduce overall food intake which will lead to weight loss. Conversely, dosing with lots of insulin to cover a poor diet will lead to worsening insulin resistance with larger and larger doses of insulin to cover their poor diet. This vicious cycle of progressively larger doses ends in tragedy as it becomes more difficult to maintain safe levels of glucose control and typical diabetic symptoms such as peripheral neuropathy, kidney and eyesight disease become unavoidable. Lots of exogenous insulin will also suppress lipolysis and make you hungrier which will drive appetite further. So, if you are taking antidiabetic medications, then a lower carb diet is a no-brainer. For people who are insulin resistant but not full-blown diabetic, I’m still a big believer in reducing the insulin load of your diet to the point that you can achieve stable blood glucose levels, but not so much that you compromise nutrient density. There is a trade-off between insulin load and nutrient density. Unfortunately, some people get so caught up in being ketogenic that they end up decreasing nutrient density and increasing the energy density of their diet so much that they end up putting on weight due to an excess energy intake. There is now a growing movement of online groups of people who have been burned by this ‘keto or bust’ mentality, chasing ketone readings by ingesting copious amounts of refined dietary fats or exogenous ketones. I think a more prudent approach is to titrate carbs down to the point that you achieve great blood sugars and then focus on improving food quality and nutrient density. For most people, reducing carbohydrates is helpful, not because it may increase ketones, but because it is a means to manage and minimize chronically elevated blood glucose and insulin levels which are the primary drivers of metabolic complications. Ultimately, we still need to address the cause of the problem (insulin resistance) via creating an energy deficit and losing body fat to below your Personal Fat Threshold. There are a range of studies that suggest that a lower carbohydrate diet is better for weight loss for people who are insulin resistant. However, the recent DIETFITS Randomised Clinical Trial of 609 obese participants at Standford led by Christopher Gardner indicates that there wasn’t a statistically significant difference between the effects of a healthy lower fat versus a healthy lower carb diet for people who do not have diabetes. On average, both diet groups reduced their energy intake by about 500 calories, not by tracking, but by focusing on improving their diet quality (though again, the healthy low carb diet group reduced their energy intake by about 50 calories more than the healthy low-fat group). Perhaps one of the main reasons that a low carb diet works so well for so many people is that so many of them are insulin resistant. A low carb diet quickly helps to stabilise blood glucose and insulin levels which in turn helps to normalise appetite as well as eliminating many processed nutrient poor hyper-palatable foods. In this video, Chris Gardner explains that study and points out that it was the people who changed their relationship with food and learned to make more nutrient-dense whole food from fresh ingredients at home that did the best overall. In line with these insights, the Nutrient Optimiser algorithm firth helps you to stabilise your blood glucose levels with a lower carbohydrate diet and then guides you to focus on more nutrient-dense whole foods which tend to be more satiating and enable you to spontaneously reduce your energy intake. If you are insulin sensitive, you will be able to grow both muscle and fat more effectively. While many people think that insulin resistance causes obesity, you actually need to be relatively insulin sensitive to get morbidly obese. You become insulin resistant when your fat cells become too full to hold the excess energy that you are taking in. When you reach your Personal Fat Threshold, your body can no longer force excess energy into storage in your fat cells and it gets stuffed into other places that are more sensitive like your liver, your brain, your heart, your pancreas. When your fat can no longer take up excess energy, it overflows into your bloodstream in the form of elevated glucose, ketones and free fatty acids. Reducing carbohydrates can help manage the symptoms of diabetes and stabilise blood sugars. It can also avoid the excess fat storage that can often come with the use of excess exogenous insulin. However, for people who do not have diabetes, focusing on nutrient-dense whole foods and maintaining an energy deficit will likely be more important to reverse diabetes and improve insulin resistance. You can reverse insulin resistance by maintaining an energy deficit until you are below your Personal Fat Threshold. Your adipose stores will then have room to take up the extra energy without spilling it into the bloodstream and your vital organs. Special thanks for Mike Julian for sharing many of the insights and synthesis of ideas contained in this article as well as RD Dikeman (Type One GRIT), Alex Leaf (Examine.com), Raphi Sirt (BreakNutrition.com). Ben McDonald (Impulsive Keto), Carrie Burns Diulus, Mattias Lindberg (Diet Doctor), Phil Thompson, Robin Reyes and Gillian Ferwerda for their review comments! The disposal of triglycerides provides insight into what your body is able to do with excess energy. Normal areas of short-term energy storage, like the liver, are at capacity. This proxy informs the actual behaviour of free nutrient. If the trigs are high, especially if the HDL is also diminished, it is implied that nutrient is unable to find easy storage locations with the current level of basal insulin. Excellent article! I feel that this was written specifically for me and my current battles. I now understand how this carnivore diet that I have been following for a couple months has reduced my insulin resistance while eating the most nutrient dense foods I could possible eat.. I am not quite at my fat threshold but now now exactly what I need to do to get there. A couple more months of Intermittent fasting and I will be OPTIMIZED! Nice article, as a T1D I can say you (and Dr. B.) do it right! Could you tell me where the chart in the chapter titled “Do medications help?” is from? Marty thanks for this deep read linking the historical data to modern times. we are all trying to figure this out to better help people. Two things the body does is immediately respond an adapts as best it can, meaning one is not fat and becomes insulin resistant or is fat and becomes insulin resistant. Depenidng on what the body is presented with at any one time insulin sensitivity and degree to which one is storing fat varies up and down.Poor diet makes more bad things happen. “Unfortunately, these populations appear to suffer the most when exposed to hyper-palatable nutrient poor insulinogenic western food. ” As with the Pima and other indigenous peoples this is false! They ate plain white flour provided by the government. The food is not hyper-palatable but rapidly digested casuing glucose to spikes and then crash resuting in hunger activation. Leptin resistance also occurs shutting dowm the feeling of not being hungry – not because of being hyper-palatable! As well, fat is not just stored subcutaneously to the maximum storage capability as suggested before visceral fat stored simce there is no switch. As well insulin increases due to signaling die to higher blood glucose. One can also not talk about insulin without talking about glucagon which is signalling the release of glucose. What is better to look ar is why glucagon is not shutting down. I appreciate and generally agree with the excellent survey of the insulin and insulin resistance landscape. My particular history suggests some additional points. At age 65, I was a 445 pound type 2 diabetic (diagnosed over 20 years) taking about 200 units of insulin per day, and still seeing morning fasting insulin levels of around 200 even when my diet was reasonably controlled. Insulin levels were substantially higher when my eating was off the chain. I had at least 6 previous yo-yo diets where I regained at least 100 pounds. I am now age 70 with typical morning fasting insulin levels in the 80’s and weigh around 255 pounds, having lost around 190 pounds, using several approaches varying over different stages. I would add the following observations to your article. 1). Looking back, the single most important factor in my progress was to “dial down” my compulsive yo-yo diet hunger. A nutritionist who had me write down a food log said that I ate a good variety of foods, and was probably not suffering from nutrient deficiencies. For me, hunger was the central factor. Eating a moderate ketone, carb-restricted, diet was essential for me to get rid of the compulsive hunger. Dave Asprey’s blog discussed research studies indicating how moderate ketone levels reduced the effects of certain hunger hormones. That research suggests my experience with ketones and hunger is not completely personal. I believe that without moderating my compulsive hunger, I would have failed a seventh time. 2) My glucose / insulin response has not normalized even with 190 pounds of all fat loss, although the response has improved. In the initial phases of my weight loss, it would take approximately 5 days for my glucose levels to return normal after a high glycemic meal. Now it takes about 15 to 25 hours to come back down. Glucose levels for a metabolically healthy person return close to normal after only 3 hours of a glucose tolerance test. 3). I may be a a recovering type 2 diabetic with long term damage to beta cell populations. My Dr ran a test which showed that I still do have at least some beta cell function, so I have luckily not destroyed all of the beta cells. 4). For now, I still eat ketogenically to control my appetite and avoid 15 to 25 hour glucose elevations. I also would like to lose some more weight to turn off my obstructive sleep apnea (if still physically possible) and retire my CPAP machine. I console myself with the thought that I cannot eat generous carbohydrates any longer because I have already used up my lifetime allowance. 5) I appreciate your recommendations for adequate micronutrients. I focus on eating generous and varied micronutrients, having been strongly influenced by Dr. Walls and the Jaminet’s. I usually eat a couple of pounds of “veg” (including green, sulfur rich, and colorful varieties) per day, and eat regular portions of organ meats and cold water fish. More generally, I work on charming NESII, the Loch Ness lifestyle beastie, working on Nutrition, Exercise, Sleep, Stess, and control of Inflammation/ Insulin. I hope these observations help illuminate another little patch of the nutritional landscape. A very timely article for me! Thank you. This is a great post! There’s a big protein war going on and your perspective makes a lot of sense. thanks. fixed the typo too. Anaphylaxis to Sulphur medications hence straight on Insulin. I’d followed Atkins diet when first diagnosed in the mid 1990’s went to the gym 5-6 days a week & lost 42kgs with diet & exercise so basically reversed it. Then in 2008 I had an accident smashing up both knees & unable to work or exercise as I had to gradually do rehab over 2 years. But ultimately gained 35 kgs. Type 2 came back But I did not want to take Insulin as my Endo told me as I reasoned why do I pump Insulin in when I’m insulin resistant. I worked at The Diabetes education department in one of Sydney’s major teaching hospitals & could see the damage Insulin was doing to patients who were not getting better on it so Ifeared it like the plague. Then I got a phone call to tell me one of my older brothers had just died from a stroke after going completely blind as a result of his Type 2 Diabetes. Not long after that I had a Diabetic emergency being raced by ambulance to hospital with HONK as my BSL’s had hit 45.8 mmol/M. My Endo hit the roof & forced me back on Insulin which I loosely controlled not realising the dangerous road I was now & as a result I have since had a stent placed in a right coronary artery which was 80% blocked I have Wet Macular Oedema requiring regular eye injections in both eyes, some neuropathy in both feet to half way up my calves. As my weight has been a battle on top of all this I seriously considered Bariatric surgery. But that scares the hell out of me. So With my new Integrative GP & Diabetes Educator they have now taken me off Insulin & replaced it with Saxagliptin & LCHF Diet about 5-6 weeks ago. I have lost over 10kgs, i’m off my Imodium up to 6 a day for IBD-D off Blood Pressure meds & Insulin as initially BSL’s had dropped to between 7.5 & 9.9. Then I got an upper respiratory virus & my BSL’s climbed again and sit between 13.1-17.5 again. Weight loss has stopped. I had increased my fat intake thinking this might help, Ketone levels went up but the BSL”s have stayed elevated. Having read this article I feel I must be really Metabolically challenged and very insulin resistant so perhaps the fat levels must be playing a bigger role and impacts BSL levels way more then I realised I need to get these BSL’s under control as I’ve compromised my health substantially already & want to manage it and my weight properly now I have educated myself more. What would you suggest I do to optimise weight loss & Diabetic control of BSL’s reduced fat, increased protein or another alternative. I don’t want to end up like another brother of mine who has had a kidney transplant and both legs amputated due to his Diabetes Type 1. I don’tmean to offend anyone here if this has not been the right place to bring all this up. I was just gobb smacked to read this article and find out that fats could affect insulin in such a way. Thanks for the article & insights.